YOUTH WILL HAVE ITS DAY « THE BRYCE IS RIGHT! – Some disturbing social trends I have trouble understanding. I have been monitoring social trends emerging among young people. I am not here to harangue about them as much as to try to understand why they occur. Fashions such as clothes, music, and dining are one thing, but some of these other trends speak volumes about our culture today. It should come as no surprise our young people are a generation of extreme game players. Games like pinball, air hockey, and foosball are relatively lame as compared to today’s lifelike computer games to commit grand larceny, engage in war, and conquer the cosmos. Such games are so addictive, it tends to change their social behavior. For example, young women today have trouble relating to young men who are imbued with this technology. As the ladies explain it, it is retarding the maturation process of young men. Instead of seeking romance and responsibility, they would rather be playing their PS2 or Nintendo. The game players are also looking for instant gratification and seek out extreme sports to give them the same rush as their computer games. 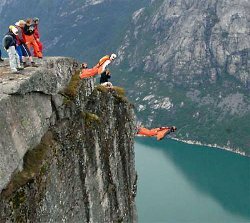 Instead of parachuting, they have kicked it up a notch to “Base Jumping” from fixed positions, or “Wingsuit” flying. Then there is “free diving” where a skin diver holds his breath for an incredible length of time at dangerous depths. Skateboarding and skiing have merged into “Snowboarding,” and “Mountain Biking” and “Free Climbing” rock walls now offer the rush young people are looking for, often with some rather dangerous consequences to match. We also hear stories of “Knockout,” an insane game where a young person randomly selects a victim, and tries to deck him/her with a single punch. This is simply perverted and I do not understand how this game can be considered fun. If this is somehow construed as a measure of a person’s machismo, then we could easily interpret this as another disturbing sign of impeded maturation. The idea of inflicting bodily harm for nothing more than pleasure is sadistic at the very least. I recently read of another disturbing trend, which I hope is short lived, namely “free-bleeding,” whereby young women refuse to use feminine hygiene products when they are menstruating. Such devices are somehow viewed as a means for men to control women. Instead, they would rather bleed down their leg as a protest to the indignities caused by men, whatever that might be. If this fad continues, I can safely assume urinating in one’s pants would also be considered acceptable behavior, particularly if we no longer have to impress the ladies. Somewhat related to this is the fad of cooking and eating a placenta, which has gained popularity over the last five years. This seems rather cannibalistic to me. I think it’s safe to say that Julia Child had nothing to do with this one. At first I thought this was a joke, but some young people, the last vestiges of the Hippies I suspect, are taking to this idea with gusto. Bon Appétit? No thanks, I’ll settle for a Spam sandwich. “Wildings” seem to be still in vogue. This is where groups of youths cause mayhem in public settings, all in the name of fun. Recently, hundreds of high school students descended on the Florida State Fair and ran amok, stealing, destroying property, and jeopardizing the safety of other people. I tend to think of a “wilding” as a “flash mob” gone wrong. Both are well orchestrated and make use of social media to communicate. It’s this technology edge which separates wildings from the riots of the 1960’s. We are also witnessing the rise of marijuana, both for medicinal and recreational purposes. In Vancouver, they now have vending machines dispensing crack pipes. I find it rather amusing that those who want us to stop smoking tobacco are the same ones who want to legalize illicit drugs. Let me see if I can summarize the mindset here: Young people are looking for instant gratification, seeking a rush regardless of the physical risk involved, and are easily influenced by technology. It appears the more extreme the idea, the quicker it is embraced. It also indicates the frenetic pace our youth have assumed. The real test comes when they become parents and have to deal with these same sort of extreme trends themselves. I wonder how they will advise or admonish their youth. NEXT UP: LET’S SIT DOWN AND TALK – The need for some simple, candid discourse. LAST TIME: MATRIMONIAL TERRITORIALISM – Knowing one’s boundaries is always a smart move. This entry was posted on March 3, 2014 at 6:00 am	and is filed under Social Issues. Tagged: Florida, palm harbor, The Bryce is Right, tim bryce, YOUTH WILL HAVE ITS DAY. You can follow any responses to this entry through the RSS 2.0 feed. You can leave a response, or trackback from your own site. “What have we done as a society by allowing the “whatever” concept to be the norm – where nothing is wrong – if it feels good do it – you are expected to accomplish nothing productive – just do “whatever” makes you feel good, excited, or special. After all, you are “entitled” with no responsibility to contribute to others or to your Country as citizens. QUITE annoying & bothersome to say the least. I know all these things are available Tim, but, when I was in the 7th grade in 1954… Kids use to stand in front of another kid behind him, take 10 very deep breaths and the kid behind would wrap his arms around the kid in front and he would pass out for 10 or 15 seconds… jump right up and do it again… 1954! Not all kids did this, just a few… With no I’ll effects. Did you know that out of about 350 Million people in the USA, only about 175,000 make their living from music?… and that according to the Department of Labor earn about $22.00 per hour? What I am saying is that the participants in the type of activities you speak of are very few and it is not an epidemic, or God forbid, a pandemic! I got knocked out in the play ground at school many times in 1954 and in 1956 went on a tour (at 16) across Canada playing drums in a band in a midway burlesque show and just got home (at nearly 72) from playing in a rock and roll band in my lovely little retirement town in Ajijic, Mexico… didn’t shorten my life one iota. I don’t smoke, drink coffee or booze or have I done dope and my goal right now is to be the oldest performing drummer on earth… will take at least another 15 years! Defying the odds… always! Doing stupid stuff… kind of! Killing myself… never! WE HAVEN’T SEEN ANYTHING YET !